As California spirals deeper into a housing crisis, students feel the pressure. At UC Santa Cruz, reduced housing guarantees and increasing admissions mean on-campus housing is becoming scarce. In 2017, UCSC decreased housing guarantees for Educational Opportunity Program (EOP) and transfer students because of increased demand for on-campus housing. Students the school cannot accommodate now face the daunting task of navigating one of the least affordable housing markets in the country. Currently, EOP students are offered a three year on-campus guarantee. New transfers can expect a one year guarantee. Before 2017, transfer students were guaranteed two years of on-campus housing and EOP students four years. These changes directly impact students searching for housing. Housing guarantees ensure students have housing on campus for at least part of their undergraduate careers. UCSC’s current housing policy assures incoming freshmen a two-year, on-campus housing guarantee, but it is often still difficult to secure on-campus rentals. 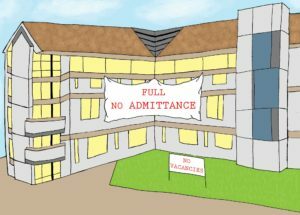 After their guarantees are up, students usually opt to move off campus rather than test their luck with long waitlists for on-campus rooms. UCSC has the capacity to house 48 percent of all enrolled students. UCSC’s housing facilities were designed with a capacity of 7,060 beds but administration added 2,278 beds of residential density to accommodate enrollment growth and housing demand. The addition of beds means UCSC is operating at 127 percent of design capacity. Associate director of Student Housing Services Kevin Tresham did not provide City on a Hill Press with comments at time of press. EOP provides support and resources to improve retention and academic success of first-generation college students and students from low-income backgrounds. Undocumented students, foster youth, and current or veteran military service members are automatically granted EOP status. “If I didn’t have the housing guarantee […] that would be an extra stress I would have to think about aside from paying just to be here,” said third-year EOP student and EOP administrative receptionist Karen Lara. Data collected by UCSC Community Rentals indicates in 2017 the average rent for a household room in Santa Cruz was $942 with rent prices ranging between $600 to $1,450. In 2018, a single occupancy room in a campus residence hall with a seven-day meal plan costs students $2,082 per month or $18,738 annually. Five- or seven-day meal plans are required for students in residence halls. This housing price is a $549 total increase from the 2017 rate for the same room. These rates are hard for most to pay, especially for students from low-income families. To lessen this stress, EOP provides support for students who are first-time renters. In 2017, in response to cuts to housing guarantees, the Student Union Housing Working Group (SUHWG) released a list of demands directed at the Colleges, Housing and Educational Services (CHES), the UCSC administrative leadership and the UC Board of Regents. Those demands state the decision to shorten guarantees negatively impacts already vulnerable students. SUHWG calls on the university to reinstate four-year EOP and two-year transfer housing guarantees and to implement an unstipulated housing guarantee for undocumented students. According to UCSC’s 2018 Student Housing Demand Analysis, students’ overall satisfaction with on-campus housing decreased 18 percent since 2014. This decline can be attributed to increased overcrowding in residence halls and apartments, according to the analysis, as the university scrambles to provide beds for increasing numbers of newly admitted students. UCSC could support students by making on-campus housing affordable, and building new affordable housing options to alleviate students’ reliance on loans just to be able to afford to live in Santa Cruz, Jeff Hao said in an email. Additionally, it could offer counseling and legal assistance when it comes to dealing with landlord disputes and work on building better relationships with city residents so students feel welcomed into the community. “In summary, the UC is failing its student body and it could be doing so much more to help all of us,” Hao said in an email. UCSC’s Housing Services office sent an email on Aug. 27 requesting faculty and staff consider renting rooms in their homes to the several hundred students without housing guarantees waitlisted for on-campus housing. In addition to its obvious effect of underscoring the unavailability of housing in Santa Cruz, the email raised concerns of student safety being compromised in living arrangements of this sort. SUHWG’s list of demands insists the university reconsider the rules and regulations outlining the rights of student renters. The demands seek to protect basic needs of students such as safe living conditions, close proximity to classes and reasonable rates.